Première of &Y03 Music Device Made of Vehicle Parts Yamaha Motor and Yamaha Corp. Host Joint Design Event Based on the Theme of “Tracks,” the “Ideal Time and Setting” as Conceptualized by the Two Companies Together Exhibition of Design Concept Models and Products plus Demonstrations - News Releases | Yamaha Motor Co., Ltd.
Yamaha Motor Co., Ltd. (hereafter “Yamaha Motor”) and Yamaha Corporation (hereafter “Yamaha”) and announce that they will be holding the joint design event "Yamaha Design Exhibition 2018 – Tracks" at Roppongi Hills O-YANE PLAZA from Friday, October 12 to Sunday, October 14, 2018. As companies that share the “Yamaha” brand, Yamaha Motor and Yamaha have collaborated on a variety of projects based on joint design themes. A notable example is the "&Y" project, where the design departments from both corporations worked together to create concept model designs. This project has delivered a series of concepts, beginning with the &Y01, an electrically power-assisted wheelchair that performs music, and continuing with the &Y02 “auditory movement experience device” which have been actively displayed at design events both within Japan and overseas. Based on the theme of “Tracks,” this third exhibition features the première of the &Y03 eMotion Tracks (hereafter “&Y03”) music device made of vehicle parts, as well as a total of 11 concept models and products from Yamaha Motor and Yamaha. 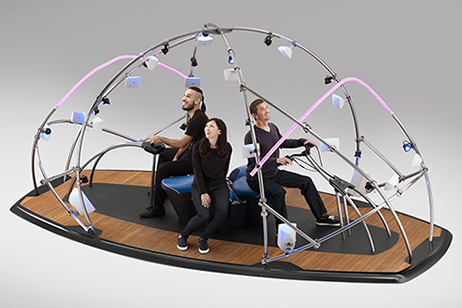 The exhibition will also include the first demonstration of music playing by the &Y03, player piano, and special automated drums together with the MOTOROiD automated riding mobility system showcased at the 2017 Tokyo Motor Show. In addition, the exhibition period starts from Friday, October 12, which coincides with the inception date for Yamaha Music. 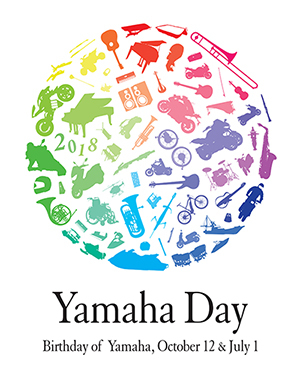 This is now being touted as a “Yamaha Day” related event to commemorate the beginning of the Yamaha brand with a range of celebrations planned from this year forward for the two companies. *Yamaha Motors establishment date is July 1. “Track” means a “path” or a “way,” and is a widely-used word in the vehicle and music worlds, such as in the terms “track race” or “soundtrack.” For this exhibition, the two companies have together - by overlaying and interweaving representations of both the path taken by a vehicle and a musical score - reconceptualized “Tracks” to express the “ideal time and setting” that the two companies jointly envisage. This is the third creation of the “&Y” project, which develops works embodying the unique style of Yamaha shared by the two companies, through delving into the possibilities of fusing musical instruments and audio equipment designs with motorcycles and other mobility designs. 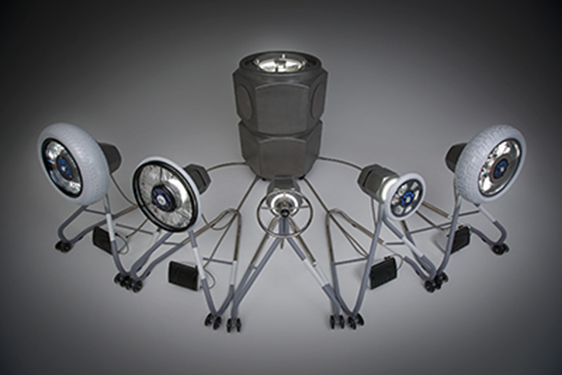 The &Y03 is a music device made of vehicle parts also created based on the concept of connecting with the entire venue space surrounding it. It evokes the enjoyment of operating devices together with friends while sharing time and space with them, a spirit inherent in the culture of both companies, and expressed through jam sessions and group motorcycle touring etc. 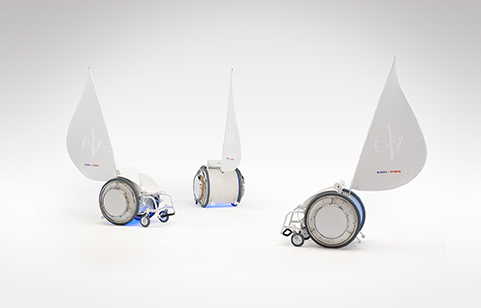 Left: The &Y01, an electrically power-assisted wheelchair that performs music. Right: The &Y02, auditory movement experience device. The true successor to the DNA of the GP Series. Revived as the fastest three-seater Marine Jet. Model dedicated to the magnetic glamor of speed. The YPJ Series delivers sports mobility in pursuit of riding enjoyment. 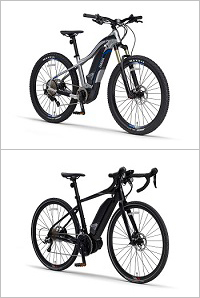 The rugged YPJ-XC provides enjoyable riding assistance, and the YPJ-ER expands the horizons of road bikes. This family model is designed for advanced ease of use, such as greater freedom in choosing or customizing child seats. The model to carry on into the future the tradition reaching back to 1978, of an identity and brand nurtured over many years. The SR400 is one of Yamaha’s flagship sports heritage models. *The exhibition will feature the 40th anniversary model. Yamaha Motor’s fourth ROV (Recreational Off-highway Vehicle) model. Particularly in North America, the demand for ROVs ranges across many fields, including commercial, recreational, and sports applications. In order to create new experiences of Kando*, this experimental proof-of-concept model employs artificial intelligence and explores creating new forms of personal mobility in which the rider resonates harmoniously with the machine. Received the ultimate accolade, the Good Design Grand Award, at the 2017 Good Design Awards. A new acoustic wind instrument which delivers both the joy of authentic performativity and musical expression as well as accessibility and user-friendliness. The new series DisklavierTM hybrid piano with player functions which accurately reproduce keyboard and pedal inputs. Expands the range of listening enjoyment through a diverse range of player content. Yamaha's first pianica designed and developed for grownups. The P-37E features rich tones as well as relaxed coloring and simple design creating a stylish look which resembles an accordion. L Series 26 Grade cutaway body model created utilizing guitar craftsmen's refined techniques and years of experience. Features the A.R.T. 3way Pickup System to fully capture the rich resonance of the guitar body. The hybrid shell construction delivers rich harmonics and a broad range of timbres. The concept model* displayed this time features a special automatic music playing device, showcasing a “natural sound” of automatically-played music. *Test playing by members of the public is not available. ■Related websites ： Yamaha Motor Co., Ltd.
■ "Yamaha Motor Design” Yamaha Motor Co., Ltd.